Small bunches of many light yellow, tiny starry flowers on pale green stems. Mild, floral flavor and aroma. 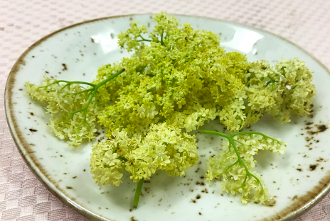 For years, Elder Flowers have been used for their health benefits and in traditional medicine. They are also used to make lemonades, teas, cordials, and liqueurs. These beauties are perfect for garnishing your drinks, floating on soups, and decorating cheese and fruit platters. Available during the Spring and Summer, May through August.